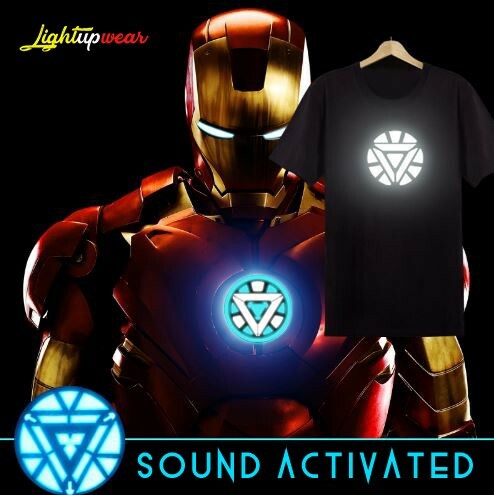 This Iron Man LED Shirt is 100% cotton and its design lights up through the music. The sound activated electroluminescent panel on the front of the tshirt reacts to the rhytm and this makes this tshirt is a perfect party tshirt. Do not submerge in water and please fold around the design, try not to bend the EL panel. LED Mask, light up mask for parties, raves and any fun event. It's extremely lightweight and cool looking. You'll rock these mask at the party! -Flexible design -Works with 2 AAA batteries (not included) -Sound activated!